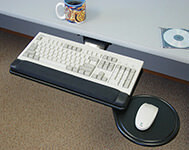 The sliding keyboard tray by Harmony Collection has a deluxe pull out system that extends on ball bearing suspensions and has a left or right mouse pad. It has a phenolic board with a vinyl wrist pad and can be fully concealed underneath the work surface. Overall measurements are 22”Wx15.75”D. The deluxe pull out keyboard tray by Harmony Collection extends on ball bearing suspensions and has a left or right mouse pad. It has a phenolic board with a vinyl wrist pad and comes with a 5-year manufacturers warranty. The inside tray measures 18.25”Wx10.5”D and the overall measurements are 22”Wx15.75”D.